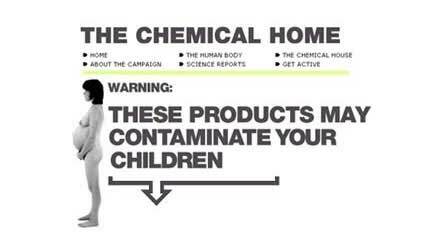 The Chemical Home is our interactive guide to the man-made chemicals that have entered your body via household products. It is a shocking fact that even newborn babies have toxic chemicals in their body fat and major organs. Over a lifetime, we continue to accumulate more of these harmful chemicals by using products that contain them. These chemicals are often unnecessary or there are safer alternatives. The Chemical Home is a consumer guide which provides you with information to protect you from harmful chemical pollutants. By using your consumer power to buy safe alternatives, and by lobbying the government to change the law, you can help us force manufacturers to take toxic chemicals out of your shopping basket. The website uses powerful images to bring these issues to life. The images are interactive, enabling you to discover more about the chemicals which may be accumulating in your body and the household products responsible. Products are coded in red, amber and green depending on their chemical content. Some products are coded red because manufacturers refused to provide information on their contents. There is also background information about chemical contamination - health impacts are explained in a simple and straightforward way, and there are in-depth scientific reports for those wanting to know more.